Howdy, y’all! This past Friday, the DMA showed folks a rootin’ tootin’ good time at our Late Night celebration of the Flower of the Prairie: George Grosz in Dallas exhibition. With a theme as big as Texas, you can bet that there was lots to do here at the Museum. With live folk bands playing in the Atrium Cafe and in the galleries, visitors could hear old-time, toe-tapping, traditional Texas music almost anywhere they went. Adult crowds could be seen gathering for tours of the exhibition and surrounding the watercolor demonstrations led by artist Scott Winterrowd. Lectures, talks, and films throughout the night also kept the adults scurrying from one program to the next. Families had a rip-roaring time in the Center for Creative Connections studio constructing their own Dallas building to contribute to a three-dimensional city skyline. Also in C3, kids created Texas-inspired bandanas and participated in Yoga for Kids. To get a peek at all the festivities, check out the slide show below. One of my favorite moments from the night was bumping into a family I had taught during a Go van Gogh Summer Library Program. When I stumbled upon them, they were in C3 doing yoga and discussing what kind of building they would create in the studio. They excitedly told me all about going into the Flower of the Prairie: George Grosz in Dallas exhibition to see all of the works of art we had talked about during the Impressions of Dallas library program. “They know everything!” the kid’s impressed dad exclaimed. It is always a joy to see familiar faces in the Museum. To learn a little more about the Go van Gogh Library Program, check out Amy’s blog post from last week. Every participant receives a free family pass, which you could use at the next Late Night on August 17. What was your favorite moment from the Late Night? Last Friday, the Museum packed in a very full house for the Late Night celebration of The Fashion World of Jean Paul Gaultier: From the Sidewalk to the Catwalk. The night’s special event, Divas of Gaultier Costume Contest, was kicked off with a fabulous Madonna tribute performance by Chris America, who got the festive audience singing and dancing. The competition featured eleven Madonna contestants and twenty Lady Gagas who put together creative and outrageous Diva ensembles. But they weren’t the only ones! Many of the visitors also took the opportunity to wear fashion from the wilder side of their wardrobe. After each contestant modeled his or her outfit, the finalists were revealed. The victors included Lady Gaga holding a teacup, as well as a real-life mother-daughter pair stylishly dressed as Madonna and her daughter Lourdes. To wrap up the event, Chris America reappeared to award the grand prize of a hundred dollar gift certificate for the Museum store and a Jean Paul Gaultier catalogue to the winner, Lady Gaga. With her slow and deliberate strut, and edgy animalistic poses, this fierce contestant truly embodied Lady Gaga herself. Photos from this fun and fashion-filled Friday are below, I hope you enjoy them as much as I enjoyed taking them! If you were to dress up for a Diva contest, who would you want to be and what would you wear? Please share your response in the comments below. The DMA’s collection offers a number of opportunities for cross-disciplinary study. Shannon has written blogs that focus on the literary connections to Abstract Expressionist works of art and other areas of the DMA’s collection. In this post, I thought I could share a few of my favorite music-related objects. 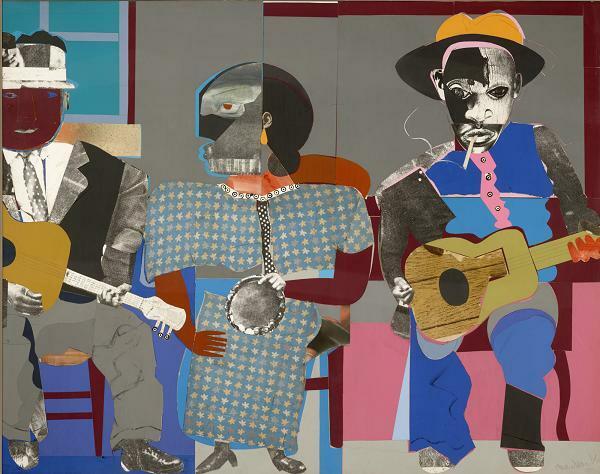 Below is a collage by Romare Bearden called Soul Three. In addition to being an accomplished artist, Romare Bearden also occasionally composed jazz music and associated with musicians such as Branford Marsalis, Duke Ellington, and Fats Waller. This musical influence appears frequently in his collages in the form of musical themes and subjects. Soul Three, for instance, shows three musicians playing guitar and tambourine. 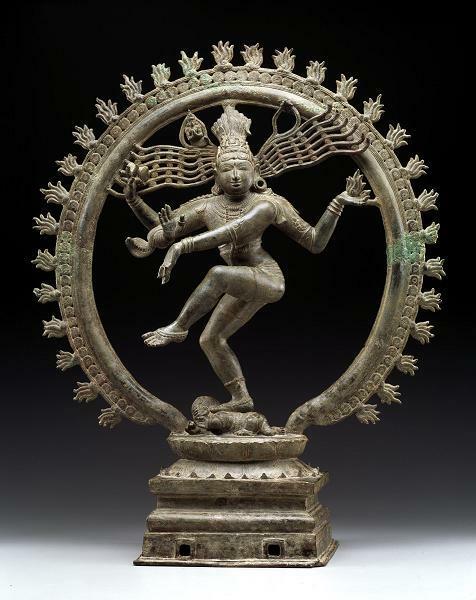 Shiva, the Hindu god of creation and destruction, is shown in the bronze sculpture below in his most transcendent state as Nataraja, or Lord of the Dance. Here, Shiva is the embodiment of cosmic energy who dances the rhythm of the universe and beats his drum in time. Music and dance, in the Hindu tradition, are considered pathways to divinity, and worshippers perform to honor the god. 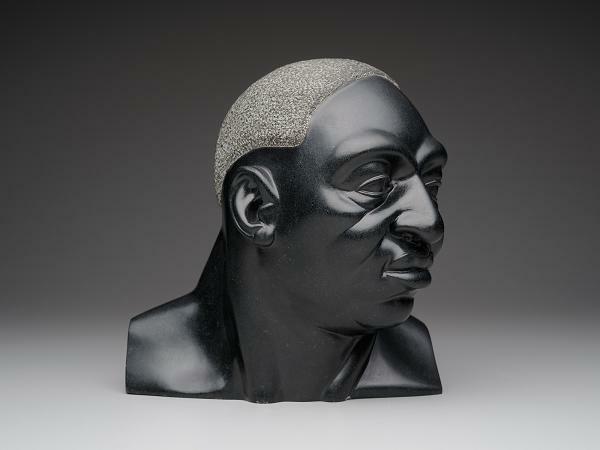 Next, this black serpentine bust of Huddie “Leadbelly” Ledbetter shows the musician as he appeared a few years before his death. Leadbelly was a troubled folk singer and two-time murderer who was reputedly pardoned for his crimes when the governor of Texas heard his music. In this bust, he is portrayed sensitively by the sculptor Michael G. Owen, Jr. 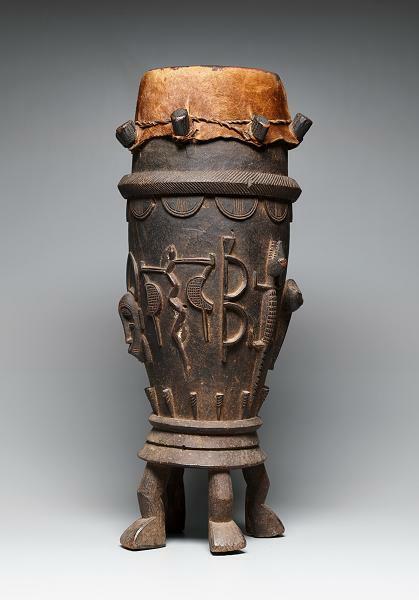 Finally, for the Senufo peoples of Côte d’Ivoire, the drum is an instrument of music and communication. Drums are used by Senufo women to accompany songs sung in a secret language to deal with gender conflicts and other frustrations, and serve as a sort of “public address system” for the Senufo community announcing important events or rituals. They are also pounded to create a rhythm which encourages competition among young men hoeing the fields. These are only a few of the many works at the DMA which celebrate music. List your favorites in the comments below. 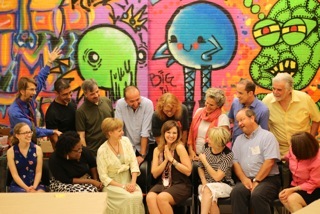 Friday Photos: Happy Birthday DMA! This month the Museum celebrated its 108th birthday! The January Late Night is our official birthday party. Here’s a look at how we celebrated last Friday during the Late Night. We are THRIVING at age 108!